If you’ve got iMovie on your iPad and you’re keen to start editing your iPhone videos on it, you may be thinking about which are the best ways to get videos shot on your iPhone over to its big brother, the iPad. Apple’s Camera Connection Kit for the iPad is your best friend for this task. You can get one for $29 via Apple’s online store, or at a local Apple retail store. The kit consists of two small connectors, the one you need for this process is the Camera Connector. When you attach your iPhone to the Camera Connector the Photos app will automatically launch on the iPad. 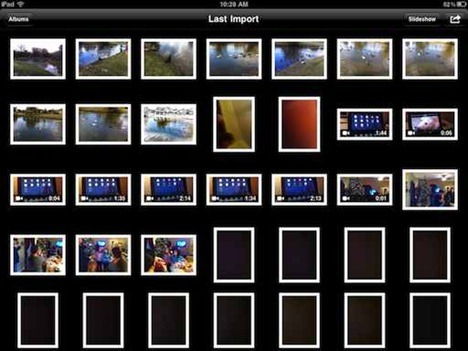 The Photos app will show you the entire contents of the Camera Roll on your iPhone. 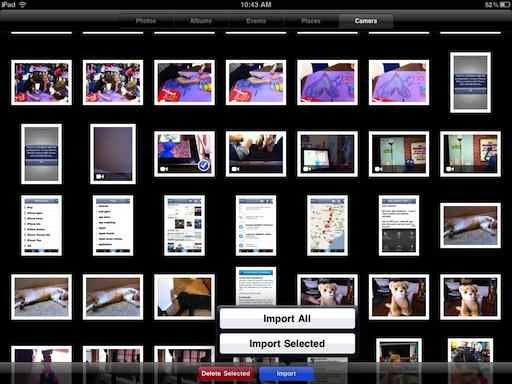 You can then choose to Import All or Import Selected photos and videos from the iPhone. If you’re in a hurry to get working with your video or videos, you’re going to want to go with the Import Selected option of course, and just transfer over the ones you want to work with. This is the fastest way to get iPhone videos over to the iPad without messing with iTunes sync. Photo Transfer App is an excellent utility app for transferring photos and videos between iPads, iPhones, iPod Touches, and PCs on the same WiFi network. It costs $2.99 in the App Store and is a universal app (designed for both iPad and iPhone) so you’ll only pay once to run it on all your iOS devices. Open the app on both devices. On the iPhone, select which videos you want to transfer. It will let you select multiple videos at once. On the iPad, in the app, tap the Device tab in its bottom nav bar. Look for the name of your iPhone and select that if it’s not already selected. Then tap on ‘Get Videos’ – and the video transfer will begin. The app has a good status bar that shows you progress on each video being transferred and a separate one for overall progress (if there is more than one being transferred). It will also give you a little ‘ding’ alert as each individual video transfer completes. Once the transfers complete, the videos will be in your Photos app, in the Camera Roll folder – so they’re accessible from iMovie for editing and jazzing up. I’m a huge fan of this app – see my recent Photo Transfer App review for more detail on it. If you’ve got your iPad and iPhone on a WiFi network and you haven’t got your Camera Connection Kit with you I think this is your next best option for transferring videos. My next option – other than iTunes sync – would be to utilize a cloud-based file sync service. My favorite is Dropbox, which allows up to 2GB free storage, offers very reasonable rates for higher storage levels if needed, and has a good universal iOS app. There are plenty of other good services of this type of course. — Depending on the length / size of your videos, uploads may be fairly slow. For videos of even a couple minutes or more this will be considerably slower than the Camera Connection Kit for sure. — Video files tend to be quite large, so this will put a fair dent in your file storage usage on a cloud service unless you do regular maintenance and remove files you’re no longer working with. — iMovie does not seem to have the ‘Open In’ feature implemented yet, or if it does Dropbox doesn’t know about it yet. So even when I sync a video file up from my iPhone to the service, it does not let me add it directly to the Photo Library – so there’s currently no easy way that I see to open it in iMovie via Dropbox. That’s my quick suggestions on how to get iPhone videos to the iPad and iMovie. What are your thoughts on this? Please let me know about better ways that you have come across. Dropbox isn’t what I am looking for considering you can only sync one picture at a time and have to take pictures using the app. I am looking for an app that will enable automatic syncing between 2 iPhones and one iPad without using iTunes and I would love to have my pictures sync on my moms iPad. What I mean by automatic two way syncing is like my calendar syncing through google. Do you know if this possible? — Dropbox doesn’t require you to take pictures using the app. You can upload from the photo library as well. — I haven’t heard of an app that does automatic syncing of the type of content you’re talking about. The best app I’ve seen for easy wireless transfer of photos and videos between iOS devices and computers is the Photo Transfer app.Works very well with minmal setup and a nice UI. Hello, I have tried many ways to get my videos on to my iPad but for some reason iMovie still doesn’t see them. Can anyone help me get my iPhone movies able to be seen by iMovie on my iPad? It seems to have stopped working. I have the connector kit, an iPhone 4s OS 5.1, and an iPad2 OS 4.3, and it transfers the files but the iPad doesn’t recognize them. Any ideas? Seems like a compatibility issue, but that doesn’t make sense cause the iPad can play other HD video. Just another way for apple to force me to upgrade? I have used the Camera Connection Kit for transferring video and photo files to the iPad and iPhone without problems when the SD card content is coming from the photo camera. But, when I change the names of the photo files in the SD card or I include more pictures or videos from the Mac in the SD card, the iPad’s Photo app did not read this new “edited” videos or pictures in the SD card. Is there any way to include videos or pictures in the SD card to be read by the Photo app in the iPad through Camera Connection Kit? thanks a lot. i was struggling with this topic the last few days. I already had the Dropbox, but you are right, it’s slow. So I tried the Photo Transfer App to transfer some videos from my iPhone to my iPad, but it’s giving me an error message saying “The video you are trying to transfer is not compatible with this device”. I took the videos with my iPhone 4s so I’m not sure why they are not compatible with my iPad. Any suggestions? Thanks for this.. I was emailing my videos to myself. It’s free, but a PITA and I had to split up videos.. I used the apple connection kit to transfer my videos and photos from iPhone to iPad2. The photos transferred fine, but for the videos, there are multiple gray boxes that says “movie” where each video should be. I can’t seem to find a way to watch the video. Any suggestions?? Have you tried opening / watching them in the Videos app? Transfer works like a champ! Thanks!!!! 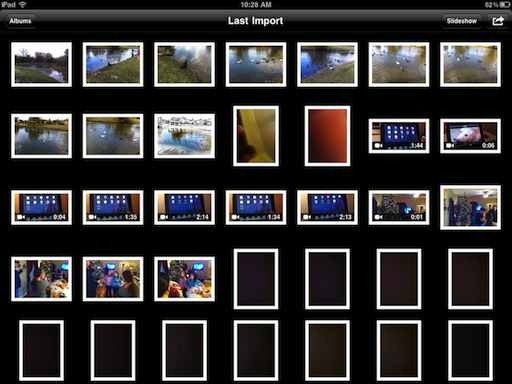 When I bought the new iPad, I needed a way to transfer my pix and videos from the previous iPad and iPhone. Tried varies methods, including Dropbox and Kensington Wi Drive, but the Photosync App from the App Store is the easiest and the most effective solution. I was able to transfer from 3 different devices (2 separate iPhone and an IPad) into the new IPad. What a perfect solution. I use iMessage to send the few videos I take from my iPhone to my iPad. Works fine and it’s free. @drmarolf has it right!! this should be the first thing on here. Okay. so, 1) if you don’t know how to iMessage your iPad from your iPhone.. first send an iMessage from the iPad to your iPhone’s phone number.. then, 2) from your iPhone reply and attach from Camera Icon in bottom left.. select “Choose Existing”.. yada yada yada.. and best part 3)send the videos in their entirenesses! 4) on iPad, save them in “to Camera Roll”. and that’s that .. BOOYAH!! For video files transfer from iPhone to iPad or iPhone I use ArkMC. It allows to share and download media. works good for me. Photo Transfer is a great solution. Worked perfectly right out of the box Glad I found this website and recommended the app. Exactly what I was looking for!